Come get OUTLOUD with us FRIDAY! First and foremost, the music! 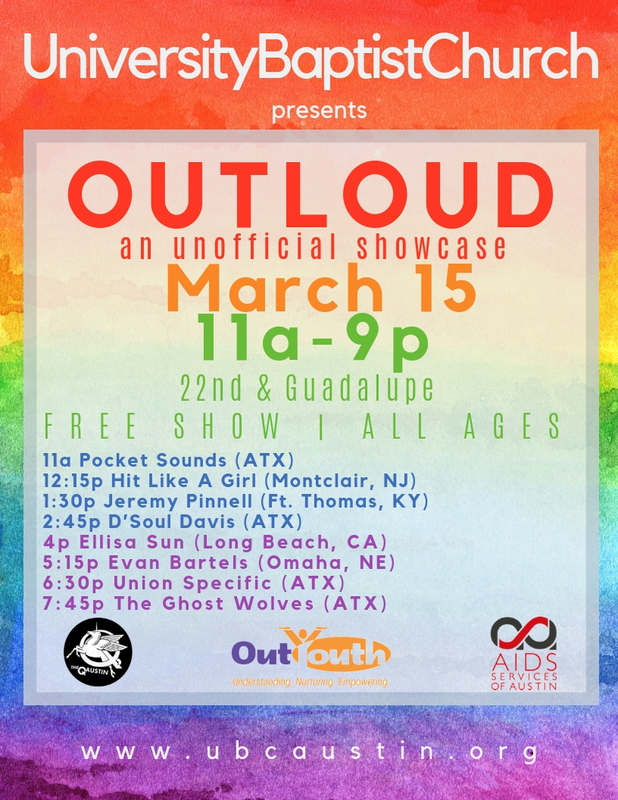 We have local and national artists joining us on our OUTLOUD stage this Friday. The headliner, The Ghost Wolves, have been touring extensively in Europe and put on a rockin’ show. Hit Like a Girl, out of Montclair, NJ not only rocks the stage, but runs a gender dysphoria non-profit called No More Dysphoria. Jeremy Pinnell lives a mile from where I grew up (no kidding!) and brings Kentucky twang and D’Soul Davis holds nothing back in speaking truth to power in the era of Black Lives Matter. Rosarito’s food truck will be parked right outside of our gate offering delicious food all day, but if you’re one of the first 100 people to enter, you’ll snag yourself a free taco! Our volunteers will be ready to show UBC-style hospitality to all who enter our grounds. And while the party itself is reason to celebrate, we celebrate the good work of local LGBTQIA+ organizations of Austin, the Q and OutYouth! So I don’t know what your plans are for March 15, but I hope you’ll plan on spending some of your day with us down at 22nd and Guadalupe. SXSW is such an invigorating time of creativity, expression, and talent in our city, and we get to be a part of that in a really tangible way! So come create something beautiful with us this Friday! And friends, this is good news, so share it! Invite friends via Facebook. Share the attached PDF in your local neighborhood groups. Grab your neighbors and throw them in the car and bring them on down on Friday. What a great way to introduce folks to the amazing energy that bubbles up at UBC. For the full lineup, check out the image above.